I like to shop for my own food. I don’t like my PAs to do it on their own. This way I am able to choose what I want. 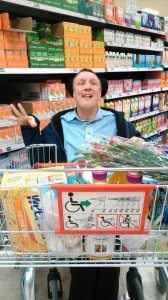 Without the ILF I would not be able to have the choice over where and when to shop. I and PA go shopping for food for friends party the next day. 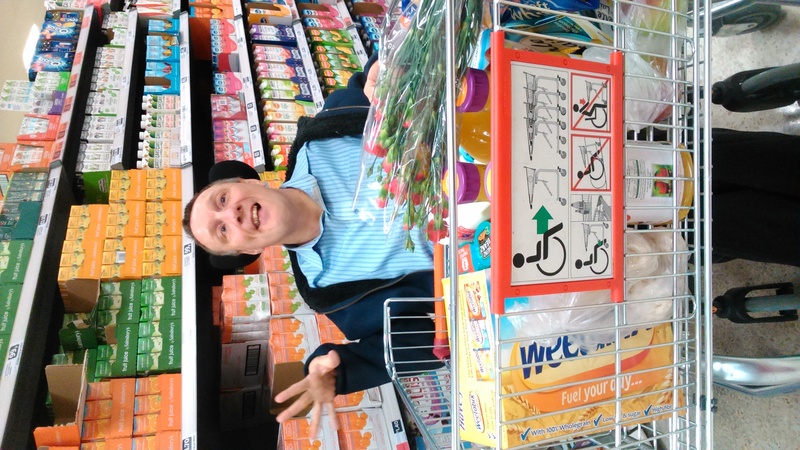 My PA drives me to shops and pushes trolley round for me. In the afternoon we take the dogs for long walk (me in wheelchair) up the canal. My PA and I start preparing the afternoon tea for friends birthday party me doing the supervising. Have to get her to go to shops to get an extra loaf. In the afternoon she drives me to party, puts out food and helps make tea and coffee. In the evening we decide to treat ourselves to a meal out. We decide to go on foot or in my case on wheel. On the way back get caught in down pour – no problem as PA here to change clothes. Before I had ILF I used to have to dry myself off with a hairdryer but mainly found myself sitting in wet clothes up to six hours. Went to London with PA to go round portrait gallery – toilets all very difficult. In the evening we went to see a friend in a one woman shows in SOHO. Really enjoyed it without ILF none of this would be possible. Got home at 10.30 straight to bed shattered but invigorated. Had lie in then in afternoon my PA drove me to Leicester did some shopping called to M and S for slice of cake and tea. Then drove to meeting of Left Unity. My PA drove me to seminar on the Care Act some 18 hours from my home. On return she prepared lunch whilst I worked on my web site. Had dinner prepared by PA the she drove me to choir. PA drove me to teach my IT student waited the drove me back. This evening she will be taking me to play in a scrabble contest. Had early dinner as off to bridge club. PA drove and waited with me in case I need to use the toilet. First time with new bridge partner seemed to get on quite well. Much better to be able to play with real people not just on the internet. A million thanks for posting this inriamftoon.